I recently decided to take a step back to my childhood and purchase Sabrina the Teenage witch box set on DVD. I will admit though that it wasn’t totally random I actually saw season one for £2.99 in HMV and I picked it up but then decided what was the point in buying just season one? So I then went to the best place to buy well anything online with Amazon and it was £29.99 for the box set containing all seven seasons! I had thought about doing separate reviews for each season but then realised that no one would want to read all of those so decided to condense it into one bigger review and after I finished a season I would then update it. Not that the seasons take very long to watch, something that is amazing with the earlier episodes at least is that I can still remember everything about them. It’s also great to see so many famous guest stars too. What I hadn’t remembered about was the constant changes in cast and therefore new friends for Sabrina. Sabrina has just had to move with Aunt’s Hilda and Zelda just before her 16th birthday. The reason behind this, well she is about to come into her powers as she is a witch. Not only is she then in a new place and starting a new school she has to deal with these new powers as well. She finds a love interest in Harvey very quickly, a best friend in Jenny and an enemy in cheerleader Libby. Being a teenager with special powers was always going to be a tricky thing to handle, but I think the messages that are sent out are good. It makes it clear that she is not to use them to truly benefit herself over the mortals and her Aunts try to set the best examples possible. I will also admit that I did not realise it has little jokes in for the adults too and some of them are very tongue in cheek! It deals a lot with different stereotypes and trying to deviate from the norm, I still would put this out early that no new tv series come anywhere near this one for young people. 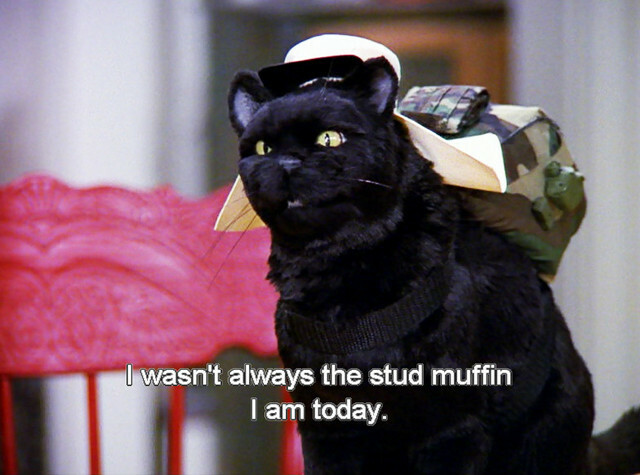 Not forgetting lots of wisdom from Salem the talking cat! Who was once a man but tried to take over the world and was punished to many centuries as the animal, probably everyone’s favourite character. Sabrina has a new friend this season in Valerie and a new awful teacher the vice Principal in Mr Kraft. Revisiting these episodes certainly confirmed that I have never ever liked him at all. Seriously what a horrible teacher! We do get Mrs Quick who was a replacement for Mr Pool in the nice department I guess. During this season as well as her school work Sabrina must study for her witches license which means that a Quiz Master pops up every now and then. Sabrina manages to earn her witches license but in order to keep it she must solve the family secret. This therefore means we are given many different family members throughout this season which certainly does make for some very interesting episodes. This is also the last we see of Libby and Valerie. An interesting thing about this season though was that I actually couldn’t remember what the family secret was, which was decent when watching it all again. Sabrina is assigned to be a mentor to another Witch this is Dreama who is new into the mortal realm, which is bad timing considering Brad is now in their High School and he has a Witch Hunter’s gene. This means he can turn them into a mouse if he accuses them of being a witch. Sabrina also starts working a coffee shop and meets Josh, who will change things with Harvey. Some very difficult episodes in this season if you love Harvey as much as I do, I mean he is not the brightest but he has a good heart! Sabrina starts Adams College and this is when everything really begins to change as she wants to live on Campus moving out of her Aunt’s house. Moving in with Roxy, Miles and Morgan and attempting to keep her magic under-wraps. This one is certainly a good advert for how it can be starting college/university and that things really do begin to change in so many ways. Although I did think it was amusing that in real life the parties would have contained alcohol but because of the nature of the show that was not something that could be shown or dealt with! A lot of this season is based on Sabrina and Josh together, yes I didn’t like that at all this second time round either. Team Harvey all the time over here, at least he makes a comeback in this season! 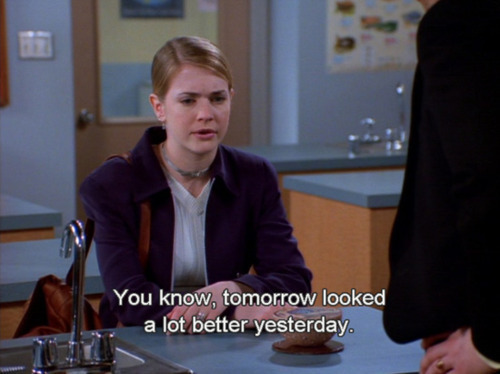 This was probably my least favourite of the seasons due to that fact, as yes Josh was an all right character but I just didn’t feel her worked that well with Sabrina. I will admit that when watching this seventh and final season I really could not remember much about it at all. I am not even convinced at had seen all of the episodes, but I had certainly seen the very last moment with a motorbike and Harvey (thankfully). I had no memory of losing Aunt’s Hilda and Zelda who lets face it were just as big as part of the show as Sabrina herself. I know they were trying to show that she was out on her own now, but the magic disappeared with them as Sabrina tried her very best not to use her magic very much. I have also read that the budget for the show had been cut so I guess that can explain a lot. Miles and Josh did not make it into this season, but the biggest and most upsetting misses were Hilda and Zelda. 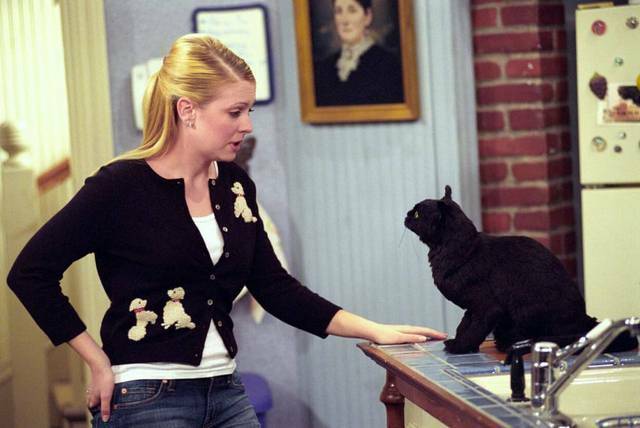 Throughout the seven seasons we are taken through Sabrina not only growing up from a teenager and learning to use her magic, but into her college years and after graduation trying to make it on her own. Finding a job and having a place to live, whilst trying to keep relationships going. We get three main boyfriends, but none ever compare to Harvey. As the viewer we just want it to happen so much! I really did not like the man she almost married in the final season, he just was not a nice character at all in my opinion. I really did enjoy watching each and every episode again and could really see myself trying this with other tv series that I used to watch when I was younger. Maybe a little bit scary that I could remember all of the lines from the first three maybe four seasons though! I still think that it carries so many great messages, many of which are more than relevant still today. A bonus was some of the guest appearances that you totally forget about and luckily my favourite has the following gif . . . The one and only Bryan Cranston! 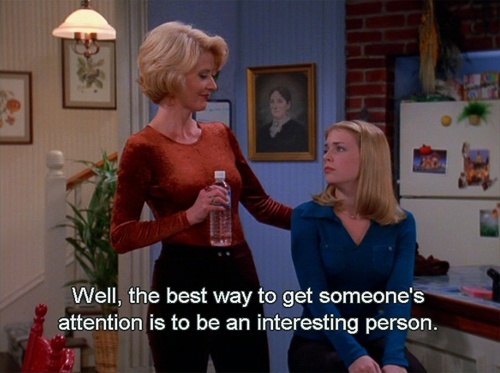 How did you feel about Sabrina the Teenage Witch? Were you a huge fan like myself? Have you never actually seen any episodes? So pleased someone else is doing exactly the same! They just don’t make them like this anymore! Hee hee…a nice reminder of the days way back then! 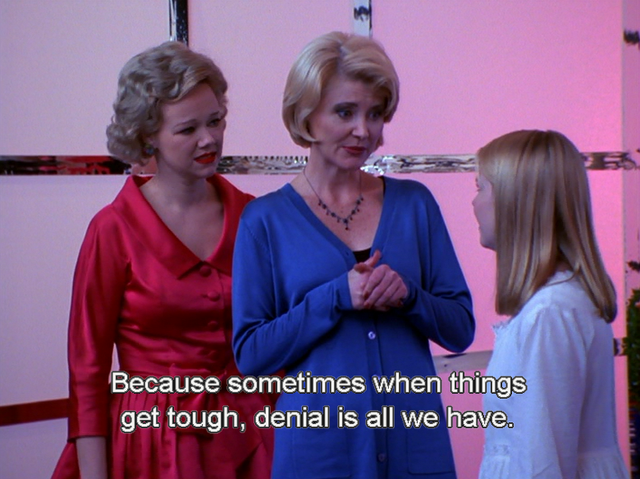 Oh it totally was, and when they used to try and teach you life lessons in TV shows. Gosh…I sounds so old…hee, hee. Don’t you love it when you speak of a movie/series that everyone in our age group knows from our teens and the “youngsters” just gaze at you like you are speaking a different language. Hee hee. Oh totally! It makes you feel so old doesn’t it! That does sound a lot better! Ask me again in July when I turned the dreaded 3-0. Happy birthday for July (I’ll probably forget by then). Have an awesome one. I LOVED Sabrina and still do 🙂 My to-go show on TGIF (and Boy Meets World). I also read all of the novels 😛 Super fan!